This is a Cross Examination of the evidence and testimony used by Pretribbers to support their position. This is a thorough summary of the full report. 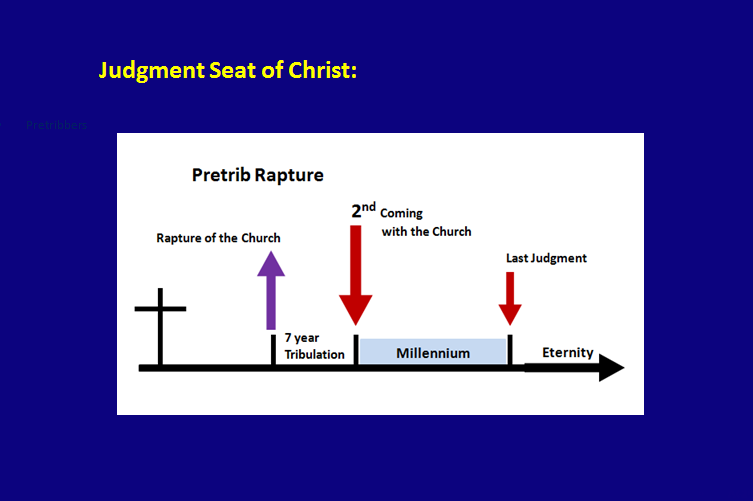 Pre- Wrath Rapture: asserts that the Rapture occurs at the end of the Tribulation, (Church removed from the earth before God's wrath is poured out). Pretribbers cite John 14:1-3, 1 Cor. 15:51-58 and 1 Thess. 4:13-18, as validation of a Pre-Tribulation Rapture. These passages do declare a rapture event however none of these passages convey a specific time when the rapture will occur in relation to the Tribulation and therefore cannot be used to validate a Pre-Tribulation rapture. 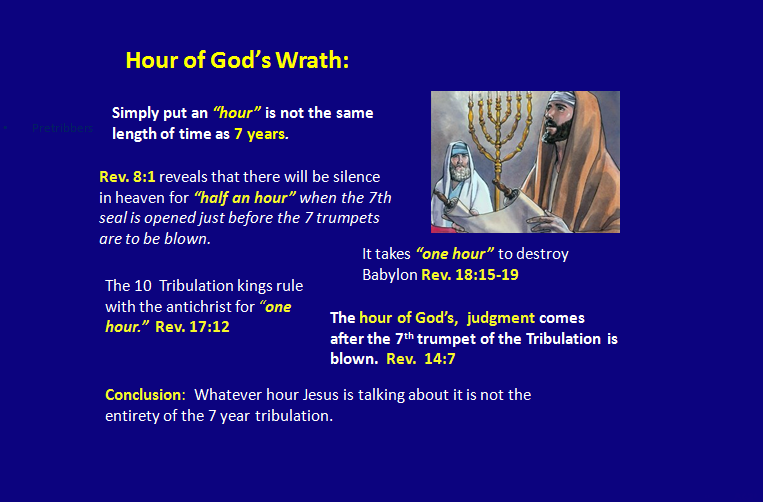 Pretribbers state that the 7 year tribulation is the wrath of God and that the 7 year tribulation takes place from Rev. Ch. 6 through Rev. Ch. 18. Pretribbers state that the Church is not depicted on earth during the 7 year tribulation because the Church is not depicted in the Book of Revelation from Rev. 6 through Ch. 18. Pretribbers state that those people who are: “in Christ” and or “in the Lord,” are a part of the Church. These people who are “in the Lord” are living and dying in the Lord after the 7th trumpet is blown, Rev. 11:15, and after the antichrist comes to power, Rev. Ch. 13. The Bible is stating that Believers in Jesus are members of the Church and will be existing deep into the Great Tribulation. The Pretribber’s assertion is contradicted by the Word of God. 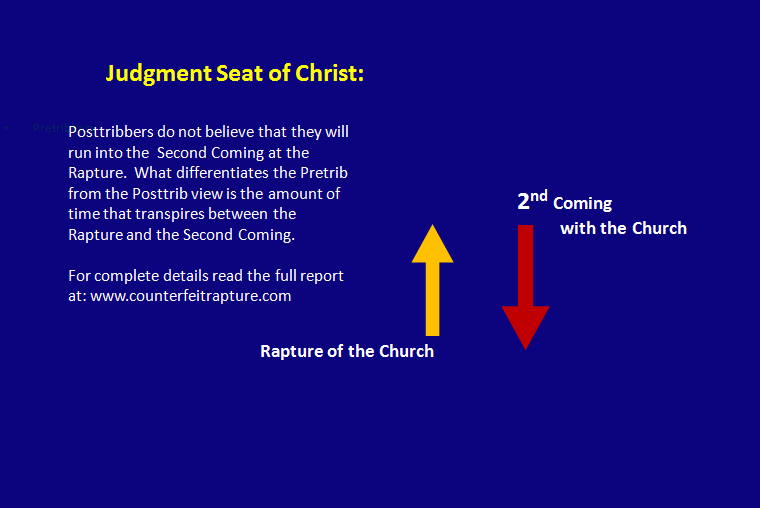 Pretribbers state that those people who are,“in the Lord” will take part in the Rapture. The people of Rev. 14:13 who are living on earth are “in the Lord” and therefore will take part in the rapture according to Pretribbers. Rev. 14:13 is towards the end of the Tribulation. 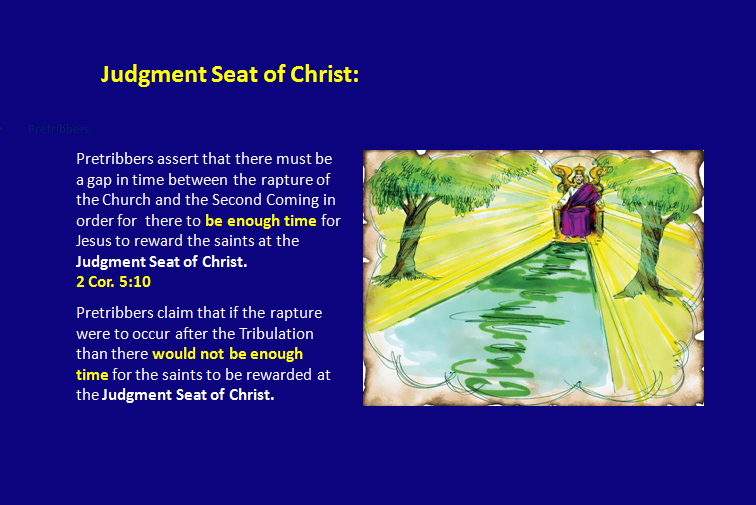 Conclusion: the rapture must take place towards end of the Tribulation or after the Tribulation has concluded. The Word of God contradicts the Pretribbers. Pretribbers assert that at the Rapture of the Church the dead in Christ will rise first and then those who are alive, who are left, will be caught up with the resurrected dead into the clouds to meet the Lord in the air. 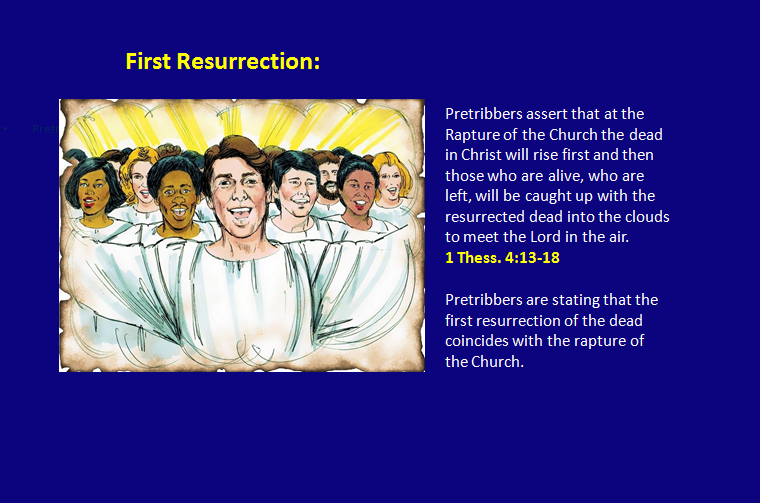 Pretribbers are stating that the first resurrection of the dead coincides with the rapture of the Church. “Then I saw the thrones, and those seated on them had been given authority to judge. And I saw the souls of those who had been beheaded for their testimony of Jesus and for the word of God, and those who had not worshiped the beast or its image, and had not received its mark on their foreheads or hands. And they came to life and reigned with Christ for a thousand years. Rev 20:4-6 describes Believers in Christ who lived on earth during the Great Tribulation at the same time as the antichrist. These Believers take part in the first resurrection. Since the first resurrection is the rapture of the Church than these Believers in Jesus must take part in the rapture of the Church. Since these Believers live on earth at the end of the Tribulation than the rapture cannot take place before the Tribulation begins but must take place at the end of the Tribulation. The Word of God contradicts the Pretribbers’ position. Pretribbers assert that the Church does not go through the tribulation because the Church is not subjected to God’s wrath for if the Church were to go through the tribulation than the Church would be subjected to God’s wrath. 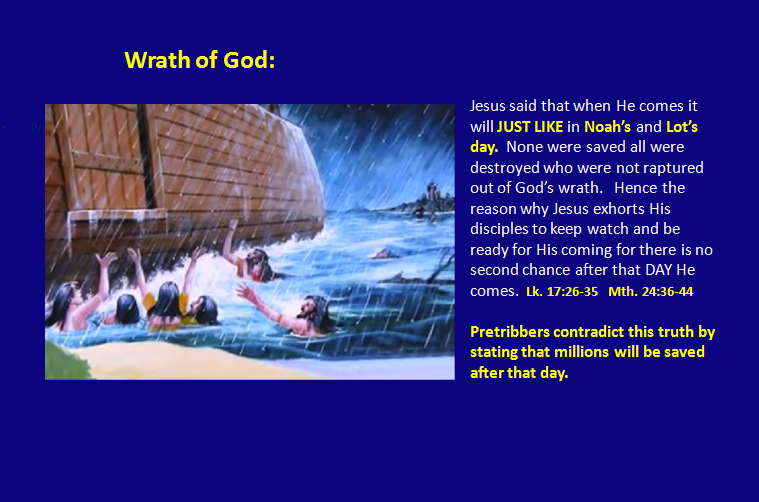 According to Pretribbers’ logic millions of Tribulation saints will be subjected to God’s wrath during the Tribulation which contradicts the Pretribbers’ own assertion and the scriptures which state that God’s people are not subjected to His wrath. Should Pretribbers argue that the Tribulation saints will not be subjected to God’s wrath but protected from it like the 144,000 Israelites who receive the seal of God, (Rev. 7:3-4 & Rev. 9:3-4), than the rationale that the Pretribbers use to justify the removal of the Church from earth so as not to go through the Tribulation no longer exists. Conclusion: Pretribbers cannot use the Wrath of God principle as a justification to support their Pre-Tribulation Rapture doctrine. Pretribbers state that the “hour of the trial that is coming upon the whole world,” of Rev. 3:10 is equivalent to the 7 year Tribulation and therefore the Wrath of God. 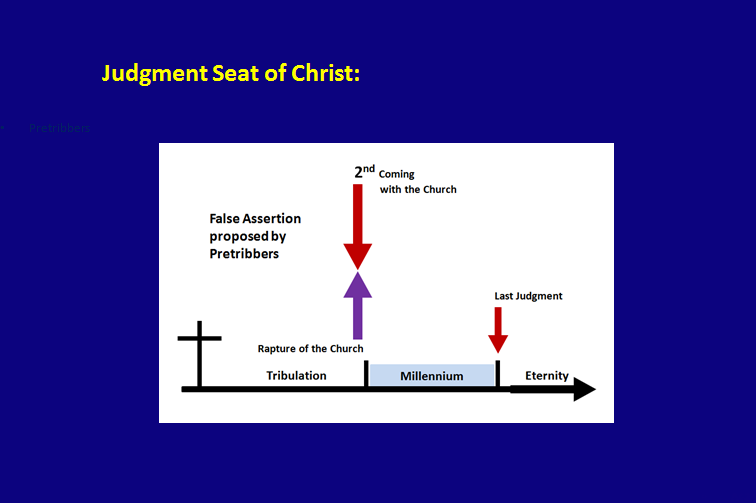 Pretribbers conclude that since Jesus is going to keep the Church “out of” the “hour of trial” that Jesus will remove the Church from the earth before the 7 year Tribulation. Matthew 24 – To Israel or to the Church? Pretribbers passionately contend that Matthew Ch. 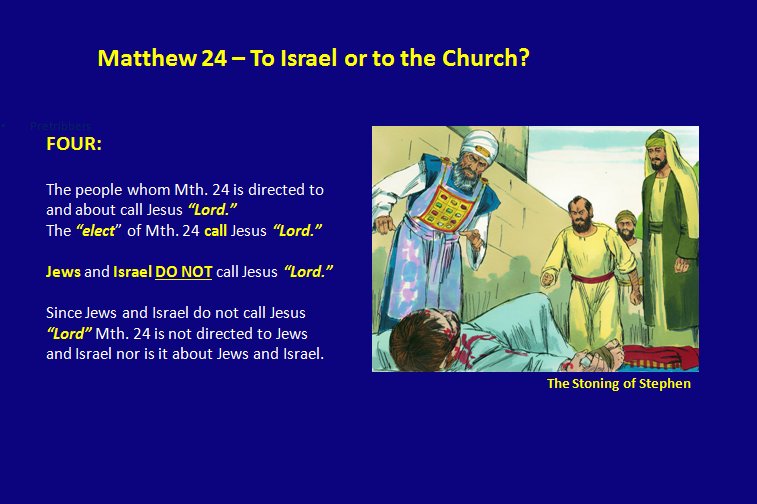 24 is a message from Jesus to Israel and not to the Church because the “elect” in Mth. 24 is not the Church but is Israel. This conjecture by the Pretribbers is false. Therefore the message in Mth. 24 cannot be to nor about Jews or Israel since it is to those people who are willing to suffer and die for the Name of Jesus. The “elect” in Mth. 24 are NOT deceived about who the Messiah is; about who Jesus is. Jews and Israel ARE deceived about who the Messiah is; about who Jesus is and will continue to be deceived until Jesus sets foot down on the Mt. of Olives. The “elect” in Mth. 24 are directed by Jesus to look for Him, the Messiah, coming from heaven. The “elect” are looking to heaven for the Messiah to come from. Jews and Israel are NOT looking for a Messiah, an Anointed King, from heaven. They are looking for a military and political leader from the earth as their Messiah. Since Jews are not looking for Jesus to come from heaven than the “elect” in Mth. 24 cannot be about Jews or Israel. These four proofs, these 4 facts, are more than enough evidence to establish that Mth. 24 is about the Church and is not about Israel or Jews. 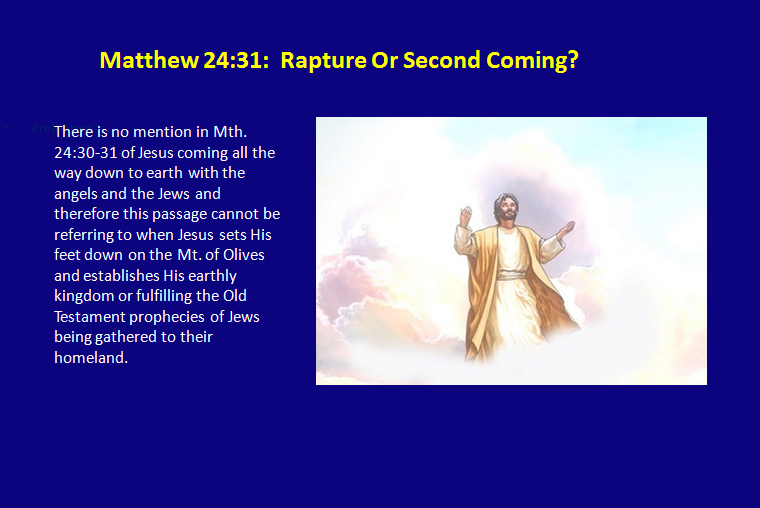 Matthew 24:31: Rapture Or Second Coming? Mth. 24:30-31 is a clear depiction of the Rapture of the Church. This passage about the rapture of the church creates a significant dilemma for the Pretribbers. To maintain their doctrine Pretribbers have come up with the fanciful idea that this passage is about Jesus using angels to gather Jews from around the world and then depositing the Jews back into their geographical land of Israel thereby fulfilling Old Testament prophecies. If the Pretribbers’ argument were true than there would be 3 COMINGS of Jesus to earth and not 2. The Bible clearly teaches that there are only two events left in which Jesus appears in the sky over the world before the Millennial Reign of Christ begins. The FIRST is when Jesus comes on the clouds and Raptures the Church to Himself into Heaven. The SECOND is when Jesus comes on a horse with the Church to establish His earthly kingdom. There is no Third time in which Jesus appears in the sky above the world therefore this idea that Jesus comes in between the Rapture and His Second Coming is something that is made up out of speculation. Pretribbers respond by stating that Mth. 24:31 is the Second Coming of Jesus. The problem with that response is that at the Second Coming Jesus comes on a horse, Revelation 19:11-16 and in Mth. 24:31 Jesus comes on the clouds which is the depiction of Jesus coming to Rapture His Church. It has been established that the “elect” in Mth. 24 is the Church. And that the angels gather the “elect,” the Church, in Mth. 24:31 and therefore the angels are not gathering Jews. The Pretribulation doctrine is significantly dependent upon the belief that Daniel’s 70th week has not been completed and will be completed in the future. Daniel’s 70th week is the last week of the prophecy given to the prophet Daniel regarding the future events of Israel in Daniel 9:24-27. 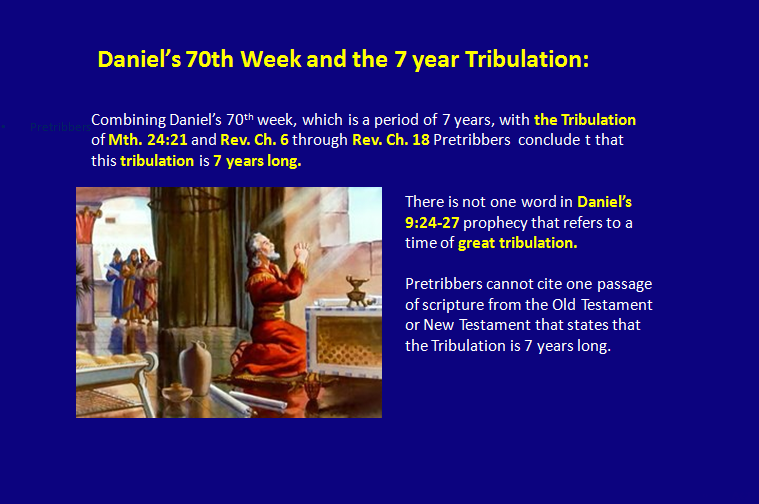 Additionally Pretribbers assert that Daniel’s 70th week correlates to the Great Tribulation of Matthew 24:21 and the events that transpire from Revelation chapter 6 through chapter 18. 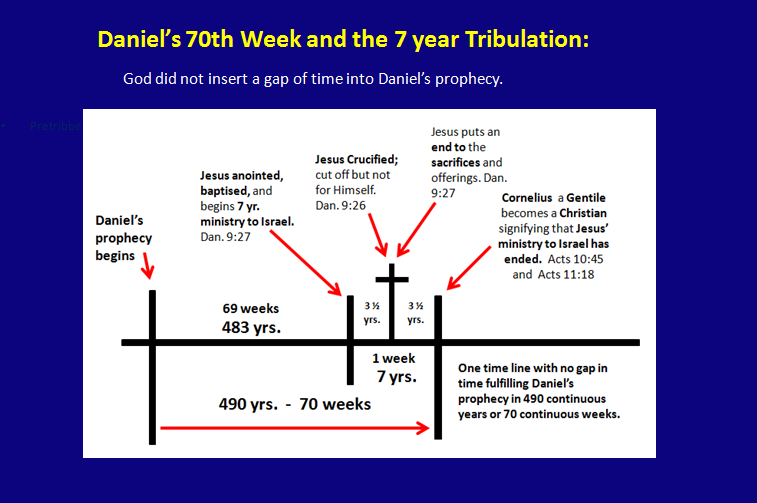 Pretribbers’ hypothesis of Daniel’s 70th week being synonymous with the Tribulation is derived from the premise that Daniel’s 70th week has not occurred because the prophetic events in Daniel’s prophecy have not been completed. Since the events of Daniel’s prophecy have not been completed they will be completed by the end of the Tribulation and before Jesus sets up His Millennial Kingdom. 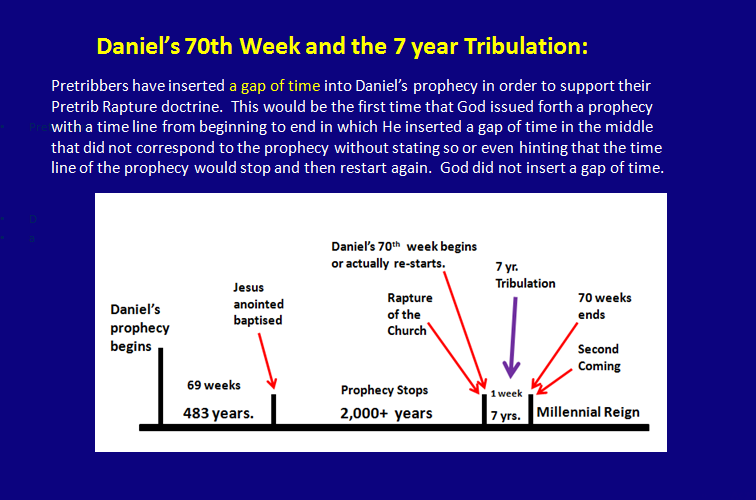 If the Pretribbers’ premise about Daniel’s 70th week corresponding to the Tribulation is to be TRUE than all of the prophetic events of the prophecy must be completed by the end of the Tribulation and before the Millennial Kingdom begins. Should any ONE of the events not be completed by the end of the Tribulation and before the Millennial Kingdom begins than the Pretribbers’ premise will be proven to be FALSE. Sin and Un-righteousness will continue to be present on earth during Christ’s Millennial Kingdom but at a much less degree of force than what they exert now. will not be completed at the end of the Tribulation and before the beginning of the Millennial Kingdom and therefore Daniel’s 70th week cannot be the same as the Tribulation as Pretribbers assert. The Pretribbers’ position is False. All 6 of Daniel’s Prophetic Events were completed 2,000 years ago. Jesus put an end of the transgressions of Israel and all people. Jesus has made an end of sin by becoming sin on the cross and able to cleanse all from sin who come to Him. Jesus made atonement and reconciled people to God the Father through Himself, to all who call on Jesus. Jesus is the everlasting righteousness of God whom He bestows upon those who receive Him by faith. Jesus fulfilled the visions and prophecies of the Old Testament prophets. In order for the Pretribbers’ theory to be true there must be a gap in time between the 69th week and the 70th week of Daniel’s prophecy. That is Pretribbers assert that 69 weeks, which is 483 years, have transpired but the last 70th week, 7 years has not. Pretribbers believe that the last week of Daniel’s prophecy will commence when the Church is raptured from the earth. 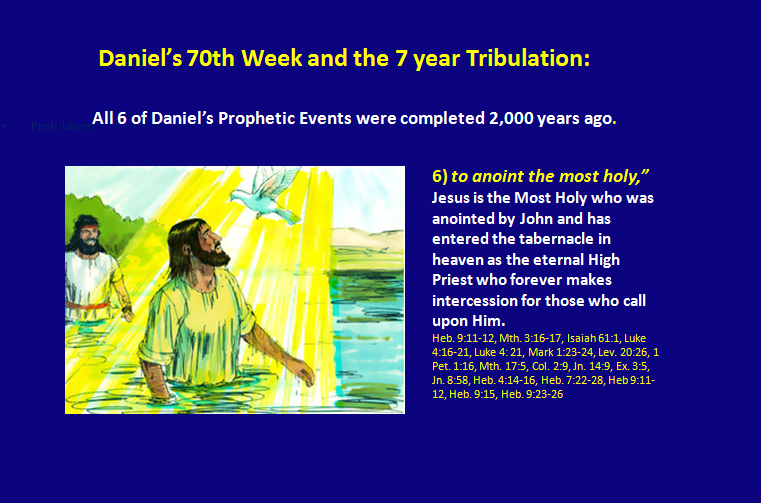 Contrary to the Pretribbers’ assertions Daniel’s 70th week cannot be fulfilled at the end of the Tribulation rendering their position invalid. Daniel’s 70th week has already been completed based upon what Jesus has already done. More evidence available in the full report. Pretribbers claim that the Holy Spirit in the presence of the Church must be removed from the earth before the antichrist is revealed and therefore before the Tribulation begins. They cite 2 Thess. 2:6-8 for this belief. One: the phrase, “taken out of the way” does not necessarily mean or prove “taken out of the world,” and to apply that interpretation is speculative. Two: “he” is not the Church for the Church is the bride of Christ and described as a female. Once again just because “he” is taken out of the way does not mean the Church is taken out of the world. Three: Pretribbers acknowledge that the Holy Spirit, the “he,” will remain in the world to bring the Tribulation saints to salvation in Christ contradicting their assertion that “he” is removed. Four: Pretribbers use these passages out of context and therefore place the events out of chronological order. When interpreting the above passages they must be done so in the context of the entire section 2 Thess. 2:1-8. 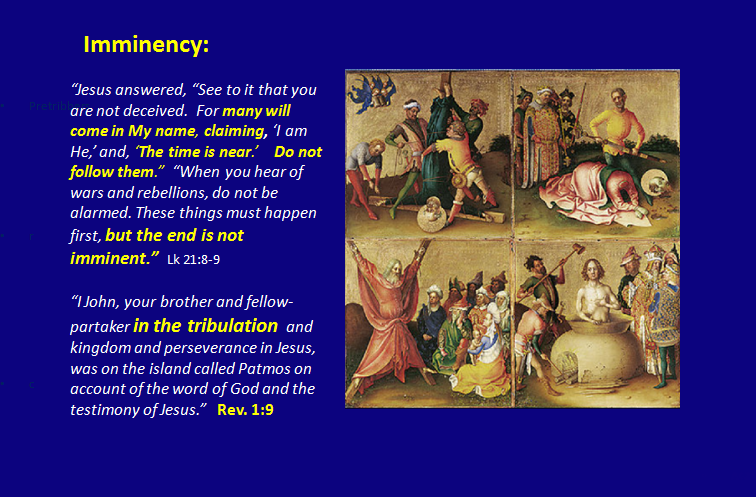 It is unambiguous, the rapture of the Church will not happen until after the antichrist is revealed. In 2018 2.3 Billion people on earth identify themselves as Christians. There are 630,000,000 Evangelicals living on earth in 2018 alone. Pretribbers state that the gap in time between the Rapture and the Second Coming is 7 years long corresponding to the 7 year Tribulation. There are 60,480 hours in 7 years. If Jesus were to spend 3 minutes with each saint at the Judgment Seat 24 hours a day 7 days a week for the entire 7 years Jesus would be able to award a total of 1,209,600 Christians. If Jesus spent 40 years rewarding the saints at the rate described above the total saints awarded would total 6,912,000 Christians. 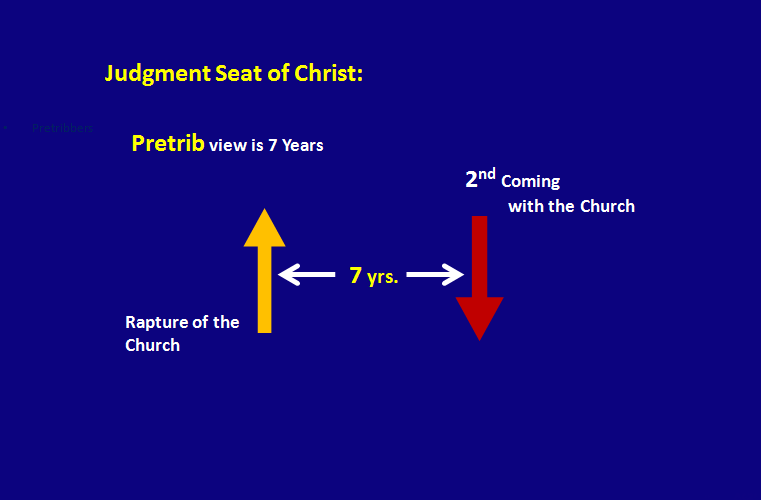 According to the Pretribbers ‘ logic only 1,209,600 Christians will be awarded at the Judgment Seat of Christ over 7 years or 6,912,000 Christians over 40 years. The Pretribbers calculations and logic is not consistent with the Word of God. If the time to award the saints is reduced to 1 minute that would amount to less than 4 million saints being awarded at the Judgment Seat of Christ over 7 years or 23 million saints over 40 years. That would leave anywhere from 607,000,000 to 626,000,000 Evangelicals with no time to be awarded at the Judgment Seat of Christ. According to Pretribbers’ logic it will take 3,645 years in order to present the rewards to all 630 million saints by spending 3 minutes on each saint and doing so 24 hours a day for 7 days a week. Or 1,214 years to reward each saint for 1 minute of time each. Or 607 years to reward each saint for 30 seconds of time each. Another reason Pretribbers use to justify a gap in time between the rapture and the Second Coming and therefore the Pretrib Rapture is the Sheep and the Goats Judgment of Mth. 25:31-46. In this parable Jesus comes and separates the goats from the sheep. The Sheep are allowed into the Jesus’ kingdom and the Goats are not, the Goats are sent to the Lake of Fire. According the Pretrib doctrine the Sheep are not Believers in Jesus of the Church Age but are Believers of only the Tribulation Age who make it to the end of the Tribulation alive and that the Goats represent all unbelievers who survive to the end of the 7 year Tribulation. In John Ch. 10 Jesus says there is only one flock of Sheep, Jn. 10:16. The Church is a part of that flock, therefore the Sheep in Mth. 25:31-46 is representative of the Church. Therefore the Sheep in Mth. 25:31-46 will participate in the Rapture. Since the Sheep are representative of the Church and the Goats do not represent all unbelievers the timing of this judgment cannot be in conjunction with the Second Coming. This judgment must occur prior to or at the outset of the Rapture. Pretribbers cannot justify using the “Sheep and the Goats” parable to validate their position. 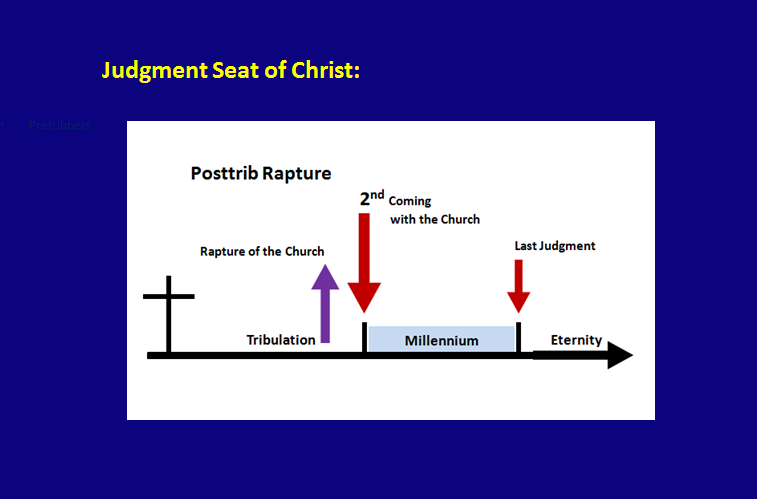 Pretribbers state that there needs to be a gap in time between the rapture and the Second Coming so that millions of people can come to saving faith in Christ in order for these people to repopulate the earth during the Millennial Reign of Christ. Pretribbers are claiming that it will take millions of people to populate the earth over 1,000 years. It took only 2 people, Adam and Eve to populate the earth in 1600 years. In fact one biblical scientist estimates that 10 trillion people were living on the earth at the time of the flood. It took only 8 people after the flood to repopulate the earth. Under the perfect the ideal conditions of the Millennial Reign of Christ with no disease, no war, nor the negative affects of sin and crime the population of mankind could increase from 2,000 people, 1,000 couples, to 449 Million in 500 years; 3.6 Billion in 600 years; 29 Billion in 690 years; 466 Billion in 810 years; 3.7 Trillion in 900 years; and 29 Trillion in 990 years. God does not need millions or even hundreds of thousands of people to populate the earth for the Millennial Kingdom of Christ. For complete details read the full report. Pretribbers assert that no unfilled sign or prophetic event needs to occur prior to the rapture of the Church. 2 Thess. 2:1-4 states that the rapture will not happen until after the apostasy and the antichrist is revealed. The Pretribbers’ assertion is false. Pretribbers acknowledge that there are many signs in Matthew Ch. 24 regarding the coming of Jesus. 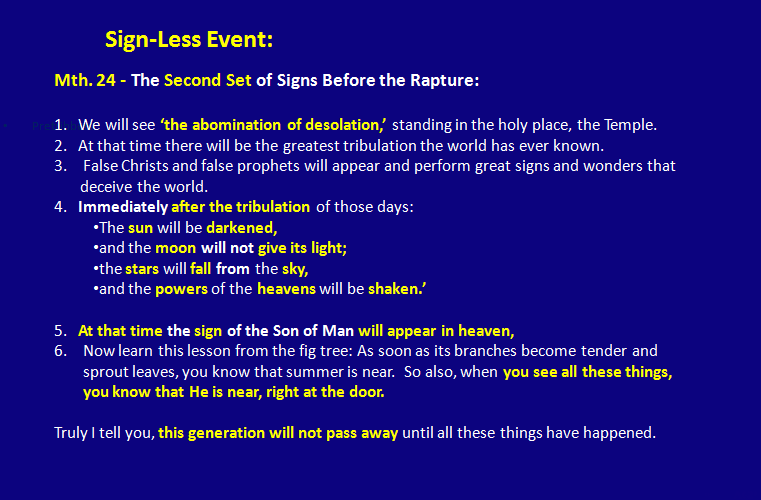 Pretribbers wrongly conclude that all of these signs have to do with Jesus’ Second Coming and not the Rapture of the Church because they also wrongly conclude that the message in Matthew Ch. 24 is not to the Church but is to Israel. Since Matthew 24 is to the Church and not to Israel the signs in Matthew 24 must occur prior to the Rapture of the Church. After all of those signs then Jesus comes to Rapture the Church to Himself. The Pretrib position is contradicted by what the Bible says. Pretribbers have put forth the idea that Christ’s return is imminent. And what they mean by that is Jesus could return today and since he could return today than no other prophetic event must occur before He returns. As pointed out in the previously 2 Thess. 2:1-4 states that the rapture will not happen until after the apostasy and the antichrist is revealed. Just because certain events must take place before Jesus comes for His Church does not mean that His coming is not imminent in that it could occur suddenly, unexpectedly and without warning. It has already been established that Matthew chapter 24 is to the Church here we see that Mth. 24:36-44 contains the doctrine of Imminency and that it is applied to Mth. 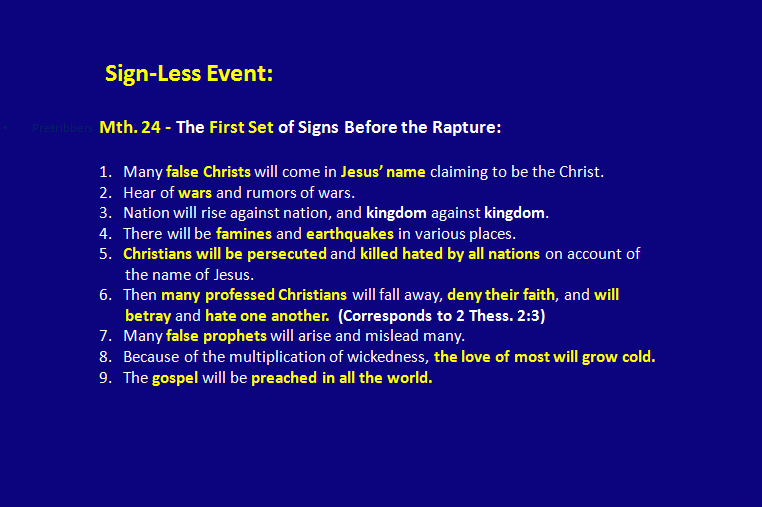 24:30-31, Jesus’ return for His Church, the Rapture after the many signs and events occur before the Rapture Mth. 24:7-29. Many of the early Church fathers believed in the Imminency of Christ’s return but also believed that the antichrist would be revealed first. Justin Martyr, Dialogue with Trypho Irenaeus, Against Heresies BOOK V.
The Didache - The Lord's Teaching Through the Twelve Apostles to the Nations. 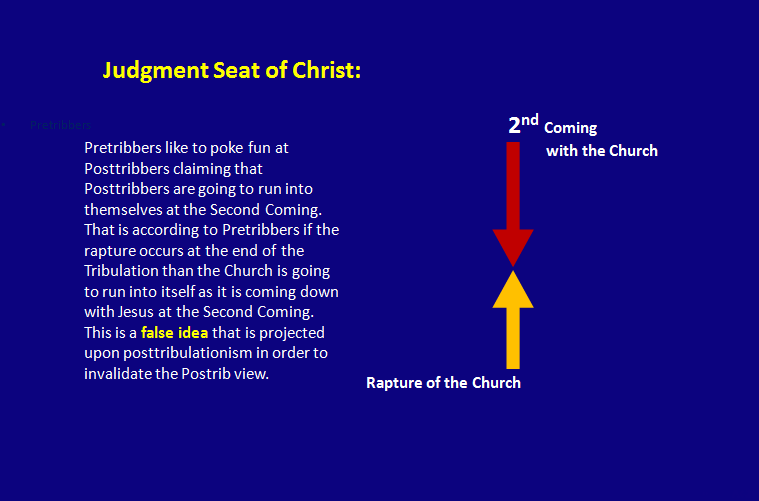 Pretribbers’ erroneously assert that Posttribbers believe that the Rapture of the Church and the Second Coming of Jesus, the Return, are that same event or happen so close in time to one another so as render the difference between the two events meaningless. Posttribbers believe that the two events are distinct from one another and occur at separate times just like Pretribbers. 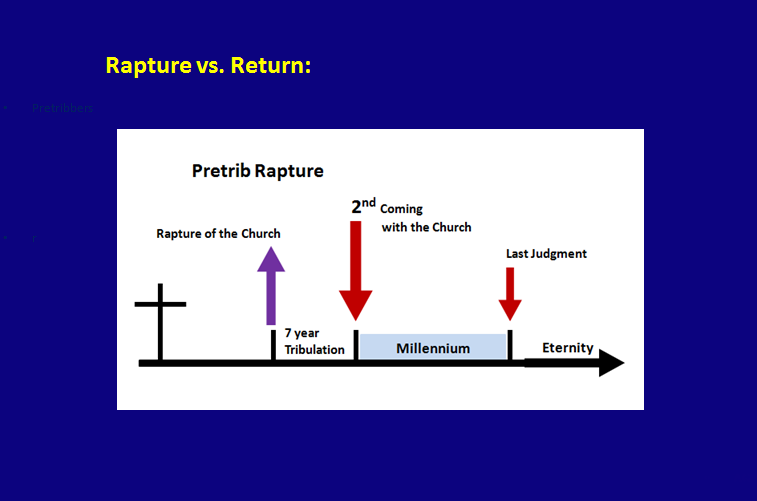 The only difference between the two positions is the amount of time that transpires between the two events and the fact that the rapture occurs after the tribulation rather than before the tribulation. 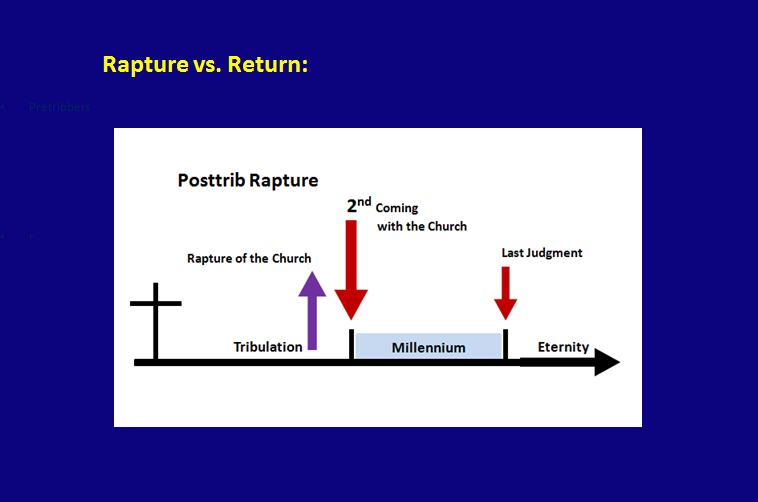 Pretribbers cannot legitimately proclaim that Posttribbers believe the Rapture and the Return are the same event to do so is misleading. Pretribbers cite Titus 2:13 as proof that the Rapture occurs before the Tribulation. 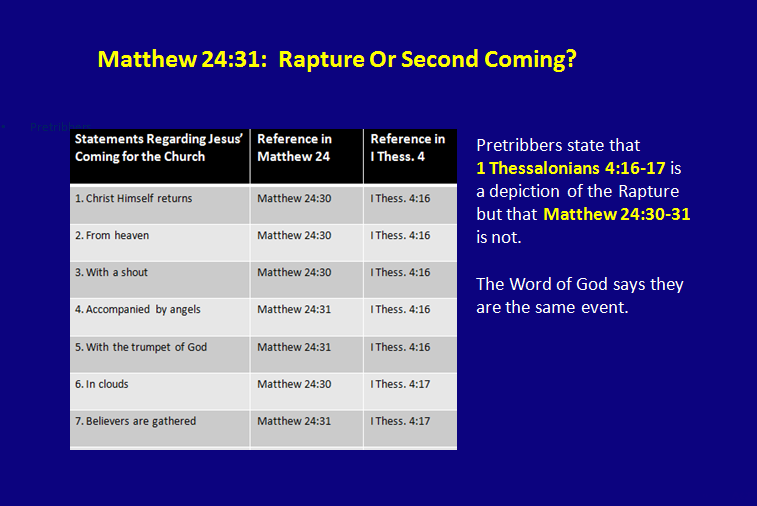 Pretribbers claim that if the Rapture takes place after the Tribulation than Jesus is no longer a blessed hope. Based upon that logic and rationale than Jesus is not the blessed hope for all of the 1st, 2nd, and 3rd century Christians who suffered great persecution and death for the name of Jesus. Based upon that logic and rationale than Jesus is not the blessed hope for all of the Christians who are being persecuted right now. But most telling is that the Pretribbers are saying that Jesus is not the “blessed hope” for the millions of Tribulation saints, those Believers who will have to endure the Great Tribulation. If Jesus is not a blessed hope for Tribulation saints than He is not a blessed hope. But we know that Jesus is a blessed hope and therefore is a blessed hope for Tribulation saints. come down to retrieve his possessions. Jesus says that when He comes it will be just like it was in the days of Noah leading up to the flood and just like in the days of Lot in Sodom when fire and brimstone rained down. On the DAY that Noah entered the ark and on the day that Lot left Sodom ALL who were LEFT BEHIND were destroyed. Jesus’ warning to His followers is that if a person is left behind like missing the boat in Noah’s day or like failing to follow the angels out of the Sodom in Lot’s day or even like Lot’s wife longing for the sinful world on the way will result in destruction. No one left behind was saved and there was no opportunity for a second chance. GOD DOESN’T LEAVE HIS OWN BEHIND. BECAUSE ALL WHO ARE LEFT BEHIND ARE DESTROYED.